Hard to choose Amanda! I think that, right now, my favorite it Garden Path! I like Garden Jewels and Garden path. Thanks for sharing! I still really love the Caramel and Cocoa! This would be such a fantastic prize to win. 🙂 Thanks for the chance! It's a tough decision to make but I'm always really drawn to Bejeweled. It's really beautiful. Thanks for the giveaway! I really like Garden Paths, just my sort of design. Big decision because I like them all but I choose Garden Jewels. Thanks for the giveaway. I am a happy follower too~ what a great giveaway! I love Garden Jewels~ it looks so summery. Thanks for the chance! I love Beflowered! 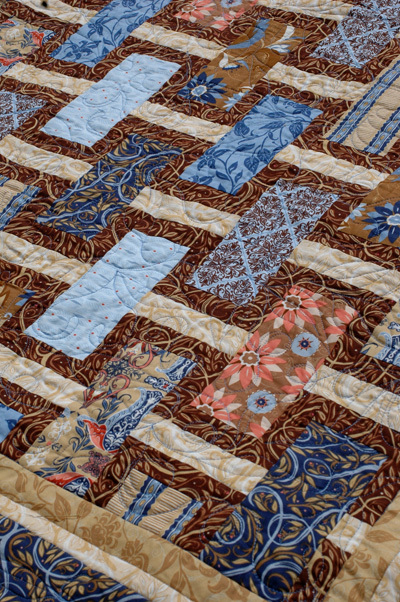 It is unusual – and mixing piecing and applique is really fun. All of your designs are wonderful, but Garden Jewels definitely has caught my eye. Garden Jewels is my favorite, it is on my "must do" list! I think it is Cafe mocha. Love this pattern very much! It's hard to pick just one! I think I would have to say Garden Jewels is a favourite. My favorite pattern is Bejeweled. I am new to quilting and have tried to make yo-yos but have never sew them on to anything. They seem a litte 'lifeless' on their own but makes such an impact when used. I'm a fan and imagine making lots of them in the future. Garden Jewels is my favourite. I have just become a follower .. you were already on my blog list. I love Cafe Mocha … actually I am working on that one right NOW! (Temporarilly interrupted by giveaway day…) Thanks for the chance to win your patterns! and the beat goes on with colours which are just outstanding. all 8? what a generous giveaway! thank you so much! i really really love beribboned (1st) and bedazzled (2nd), because i've really been loving the look of woven or intertwined fabrics lately. however, i also really love bejeweled! i'm kind of anti yo-yo on principal, but i think it would look fabulous with little circle appliques too! I love Portraits of My Garden, such a great way to showcase gorgeous fabrics. Thanks for the fab giveaway! (I'm already a happy follower of your blog). hard to choose, but maybe garden jewels. they are all great. they are all amazing but I'd say Portraits of my garden is my fav – thanks! I love Garden Jewels! But all your patterns are beautiful. Thank you for the chance to win. The one that grabs me today is Garden Jewels. But I really like them all. I really love bejeweled, but caramel and cocoa is a close second favorite. Not easy to pick just one, but Garden Paths is my favorite. Thanks for the giveaway. Garden Jewels is my favorite, I think….so hard to choose. What a wonderful give-away! Garden Jewels is my favorite too though really it is impossible to pick just one. Bejeweled is my fav. But they are all wonderful so it is very hard to choose. Thanks for the chance to win. Wow…that's a hard one…they are all lovely. My favorite is probably Garden Jewels followed by Bejeweled, Bedazzled and Garden Sampler! Wow, they're all just beautiful! I do think I'm partial to Cafe Mocha! If the rules say I can only pick one…..I would have to say Bejewled. Thanks for chance to win so many amazing patterns. It truly is hard to pick… but I would say Cafe Mocha looks like a fun one to make. Thanks for the giveaway! I think my favorite is Garden Jewels, they are all wonderful, it's hard to choose just one. Thanks. I like Cafe Mocha the best – although they are all cute! My favorite pattern is Caramel and Cocoa. Thanks for the chance! I like Beribboned. I like it when there's a sense of movement. Garden Jewels is my favorite. A friend made this one at camp and since then I've wanted to try it too. Each one is lovely. Bejeweled is the one that I would enjoy making first. Thank you for offering such a great giveaway. If I have to pick one….Garden Sampler. Garden Jewels is a close 2nd, but I love them all. Thank you! I like Garden Jewels. thanks for the chance to win! Town Square and Cafe Mocha. I can't decide between the two, they are both so fantastic to look at. I can only pick one? I want them all. They are awesome. If I have to choose, the cafe mocha is delightful. BeDazzled is my favorite one, with BeJeweled my second and when it comes right down to it, it was a hard decision. They are all great patterns. Bedazzled is my favorite but like most of them almost as much. Thank you for a chance at such a fine thing. Patterns! Good luck to everyone! Garden jewels! I love this one so much- would go crazy for it alone even 🙂 Thanks so much! I love the Garden Jewels. Thanks for having this giveaway. Thanks for such an awesome giveaway! I already have Garden Paths in the works, but if I had to choose again, it would be Beflowered! All those that begin with B & C? I love Bejeweled all kidding aside. Thanks. Bejeweled is my fave, but really I love them all! Definitely caramel and cocoa. I have that kit ready to make! Beflowered! My stash is seriously lacking in the colors you sew with so your patterns are always a breath of fresh air for me. Love Carmel and Cocoa! Thanks for a chance. I have trouble picking just one (which could be why I haven't bought any yet). But Garden Paths looks like the one I might actually sew once I got my hands on it, whereas I would admire Beflowered and Blossoms and probably stall forever in buying and cutting fabric. What a hard choice! I guess I would choose Garden Path, but all of your patterns are wonderful! I love them all, but if I had to choose I would select Garden Jewels. I love the trellis and flowers just make me smile. It would be hard to pick 'just' one…but I do like 'Bedazzled'. Your patterns are so fresh and exciting. It would be fun to make one! Love Beflowered. Thanks for the chance to win. Love Garden Jewels, also love Blossoms and Bubbles. Would love to do all of these. Thank you for the giveaway and a chance to be a winner. Definitely Caramel and Cocoa – soothing colors, modern feel. LOVE it! Thanks for the chance to win!! Hi Amanda, my favorite is the Beflowered pattern. I like them all, it was a very tough decision. Thank you for the giveaway! I think Garden Jewels is a knockout! beflowered is a favorite of mine, thanks for the chance! Garden Jewels, thanks for the chance! I think I like Portraits of My Garden the best! I love all your patterns, Amanda. At this point if I have to choose, it would be between Cafe Mocha and Garden Jewels – two things I love, coffee and gardening! I haven't met a pattern of yours that I DON'T like … but I'd have to choose Garden Jewels, followed very closely by Garden Paths ! I'm already a follower – thanks for the chance to win your wonderful patterns ! They are all amazing, but I love Garden Sampler! It would be Garden Path. I have the same name for one of my hand dyed threads. Beribboned is my current favorite but that changes every time I look at them. Thanks! Garden Jewels is my favorite, but I LOVE (and want!) all your patterns! Would love to win Garden Jewels. 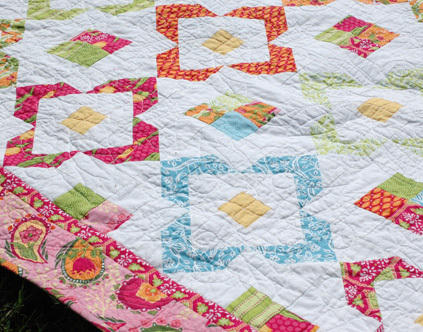 Your patterns and quilts are so refreshing and crisp. Love them. Great giveaway! So hard to choose. I love Bedazzled. I was going to say Bejewled, but this morning Garden Jewels is really catching my eye. I love the garden jewels pattern the most. Thanks for the chance to win! this is too hard to choose! Portraits of my garden or beribboned are my favorites. You choose if I win! Thank you for hosting the giveaway. Garden Jewels and Cafe Mocha are my favorites this morning, but Bedazzled is right up there too! nice work. Went to Face Book and clicked on'Like'. I like your pattern, Beflowered. 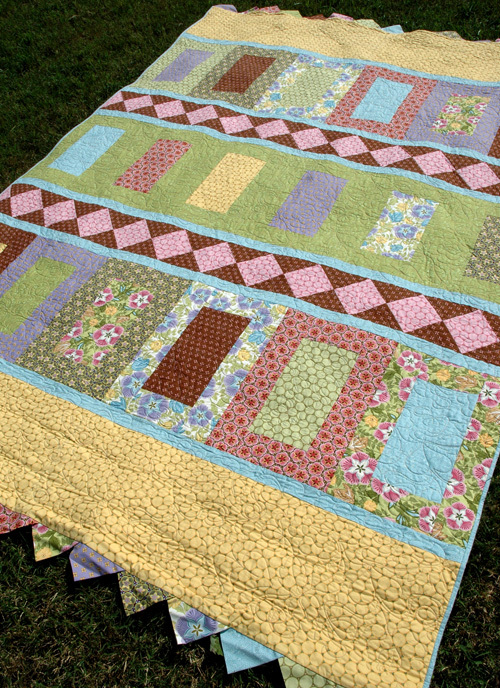 I'm thinking of a quilt for our pastor's first grand baby girl & it is so bright! Can I have two? Favorites I mean. I love your patterns. Caramel and Cocoa and Cafe Mocha. 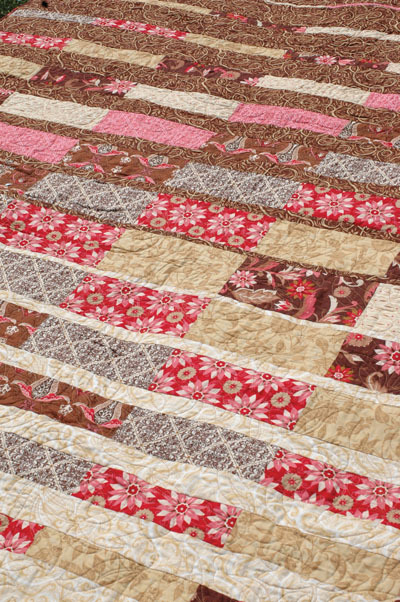 Garden Jewels is a favorite quilt pattern. I am a follower too. I think Garden Jewels would have to be my favorite pattern of yous! I love the cafe mocha pattern! All of them are lovely! thanks! Hard to decide. But my fav has always been portrait of my garden. Garden Jewels is my fav. I love the Garden Jewel pattern. So sweet. I love all of your patterns, Anna! But if I was to sew one right now, it would be Caramel and Cocoa. And I am a follower 🙂 Thanks so much for sharing! I love garden paths! Thanks for the great giveaway! I love the Bejeweled pattern. Thanks for the chance to win! Beflowered is still my favorite. I follow you. All your patterns are amazing, but Bedazzled is my favourite. Thanks for the giveaway. I really like the Caramel and Cocoa pattern. Thanks for the giveaway. I think I like Garden Jewels the best; I'm not sure. I love your colors. I tend toward the darker, "Fall" colors and these are so refreshing! Hi Amanda! I love " Garden Jewels " and also " Blossoms " My soon to be (I hope) daughter- in- law loves " Cafe Mocha" which I will be buying for her soon! My favorite, at least for the moment, is Bejeweled. I love the combo of modern fabric columns and vintage yoyo's. I have "Blossoms" on my dream list….it's just so summery! so great! I love caramel and cocoa! Great patterns! I think beribboned is my favorite. I adore beribboned. Love the lines intertwined fabric look. 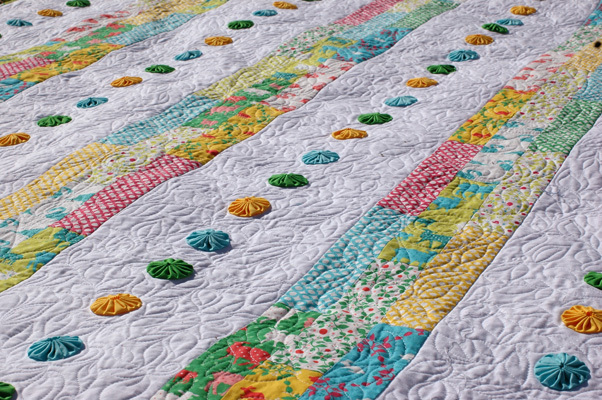 Garden Jewels is my favorite pattern because I'm a quilter and a gardener! What a great way to combine my 2 hobbies! I really Love Garden Jewels. Bejeweled is currently the one I'm loving. Thank you for a chance to win! It is difficult to choose just one, but right now it is Beflowered. Garden Jewels is one of my fav's. Garden Paths is still my favorite. I just love Garden Jewels! Town Square and Village Green… but I like a couple more too!! Hard to pick just one!! Great giveaway – thanks for letting me enter! So hard to choose but looking for masculine patterns of late and cafe mocha seems to lead that way for me – of course fabric choices make all the difference on ANY pattern… it also looks like it would appease the scrappy nature in me – or be a good variation on the eye-spy!!! I like garden jewels or Beflowered! Garden jewels. Thanks for the great giveaway! I love Cafe Mocha. Thanx for the chance. i really like the garden sampler!! Ohhh I love every single one!! I'll just cry if I win one I already have. Bejeweled is my favorite one right now. So many beautiful ones, but I love Bubbles! I like Garden Paths best ( but it was a tough choice ). Love Caramel and Cocoa! Colors are so rich and yummy looking. Thanks for having this giveaway. I'm loving the look of Caramel and Cocoa, it was hard to choose though! Each one is so different it is hard to pick just one. I think, though, that the one I like the best at this moment in time is the Garden Jewels. Bejeweled, Caramel and Cocoa and Garden Jewels! Thankd for the giveaway! All your patterns are wonderful but my favorite is Garden Jewels. Thanks for the giveaway. wow, it's a tough decision, but i'm going with village green. thanks, beautiful patterns! garden paths is SO cute. love the movement. I'm loving Garden Jewels. Thanks for participating. I love all of them but I think the one I would be most excited to make is Garden Jewels. Thanks for the chance to win it! Garden jewels is my favorite. I love them all but I think my favorite is Caramel and Cocoa. Garden Jewels (followed by Bejeweled and Beribboned). hmmm, they are all pretty awesome, but Garden Jewels jumps out at me for some reason. Thanks for chance to win!! Love then all but my favorite is Garden Jewels. Thanks for the giveaway. Would love to win one of your patterns. I would have to go with beribboned. My favorite is Garden Jewels. They are all great patterns. I like Bejeweled! Thanks for the chance to win! 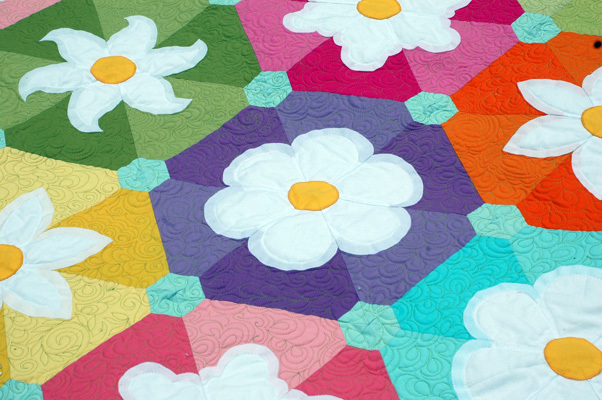 I like your Blossoms quilt. HOw can I choose…first would be Cafe Mochs…I already have a plan for that one. How do I choose just one? I love them all! I would have to pick Blossoms or garden path. I am looking for a pattern that says "summer" and I think both of them say just that. Thanks for the generous giveaway. My favorite pattern of yours has to be BeJeweled. So pretty. My favorite has to be Garden Path. That is what I tried to type earlier! LOL! Hi Amanda! I love all of your patterns, but my favorite has to be Garden Jewels. P.S. I just bought a layer cake of your fabric Veranda, and I love it! They are all so beautiful, it's hard to choose! I will choose Beflowered. I love your designs! Bejeweled looks adorable ~ all those little yo yos! That many patterns would keep me busy all year! I think bejewelled is my favourite, i'd start with that! I really love the Caramel and Cocoa pattern! What beautiful patterns. It's hard to choose a favorite but I really like Beflowered. Thanks for the opportunity to win your giveaway. I love Caramel and Cocoa…simple and lovely! Yikes – so many great choices! I keep going back to Caramel and Cocoa so I think that's the one! I'm loving Garden Jewels – looks like it would be fun to make! They are all wonderful, but if I had to pick just one…. I would pick "Bejeweled". thanks! 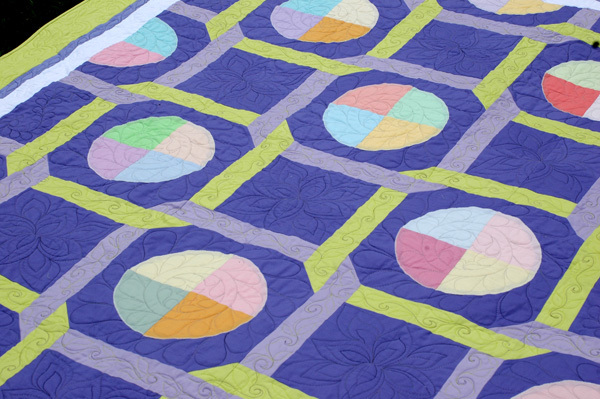 An eight quilt pattern giveaway – fabulous!! My favorite is Bubbles – I'm a polka dot gal. Many thanks! Ummm…how do I pick just one! As I was scrolling through the post I was like,"Oh I like that one, oh and that one, oh…." My favorite is Garden Jewels–though really I love them all! I really like that bubbles tablerunner on the right side also! I think you have done a wonderful job on these new patterns. It is very difficult to decide but….if I had to pick, I think, Garden Paths is my favorite. It is an excellent way to use the florals in my stash. beflowered – butI would like it more with a straight edge, but then I'm sure Icould make that. Thanks for the chance! Garden Jewels is my favourite – THANKS for the chance! Garden Jewel – absolutely love it. Garden Jewels 🙂 Thanks Amanda! 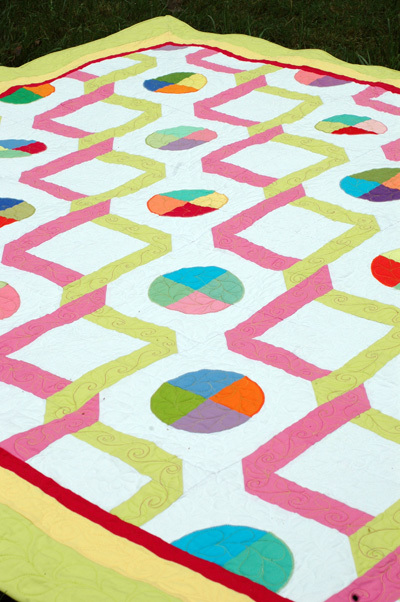 A relatively new quilter here, and just found your blog & fabrics. Uh oh, I'm in trouble! 🙂 LOVE Cafe Mocha!! Gorgeous! My favorite is portraits of my garden – I just love the garden quilts!!!!! !